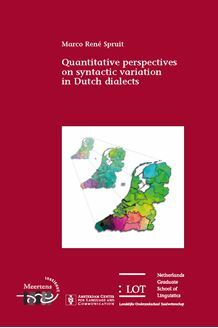 This dialectometrical research has investigated three quantitative perspectives on syntactic variation in Dutch dialects. The first perspective shows how to quantify syntactic differences between language varieties and classifies the Dutch dialect varieties based on a measure of syntactic distance. This objective classification is compared with—and highly resembles the traditional, perceptual classification based on subjective judgements. This approach also affirmatively answers the question whether syntactic variation patterns are geographically coherent. The second perspective describes how to quantify the degrees of association between pronunciational, lexical and syntactic differences. This approach reveals that the degrees of association among the linguistic levels of pronunciation, lexis and syntax are genuine but modest. Also, syntactic and pronunciational differences are not more strongly associated with one another than either one is associated with lexical differences. The third perspective demonstrates how to discover relevant associations between syntactic variables using a data mining technique based on geographical co­occurrences. This approach contributes to the validation of existing typological hypotheses and facilitates the identification and exploration of variable relationships in general.